To permanently delete a file or folder from your personal computer without sending the files to the "Recycle Bin" which you want to delete and then pressing Shift+Delete! This solution is also for Windows-10 and Windows 8.1. 1.) Permanently delete all files from the Recycle Bin! 2.) Permanently delete Individual files from the Recycle Bin! 3.) Recover files from the Recycle Bin! To delete all of the files from the Recycle Bin without opening the Recycle Bin, with a right click on the Windows-7 Desktop Recycle Bin Icon (Symbol), in the context menu select "Empty Recycle Bin" (see see Image-1)Empty the Recycle Bin, and then click Yes. ... How to show Recycle Bin Icon on the Windows 7 Desktop? Open the "Recycle Bin" a right click on the Windows-7 Desktop Recycle Bin Icon in the context menu select "Open" (see Image-1). To permanently delete one file or folder select the Folders and/or Files in the Recycle Bin, with a right click open the context menu (see Image-2) press Delete, and then click Yes (see Image-3). 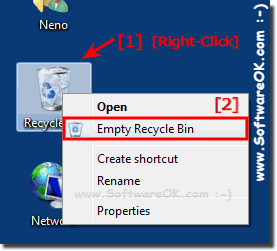 Open the "Recycle Bin" a right click on the Windows-7 Desktop Recycle Bin Icon in the context menu select "Open" (see Image-1). To Restore one file or folder select the Folders and/or Files in the Recycle Bin, With a right click open the context menu (see Image-2) press Restore. Image-3: Confirm Delete from the Windows-7 Recycle Bin! Info: To permanently remove files from your computer and reclaim any hard disk space they were using, you need to delete the files from the Recycle Bin. 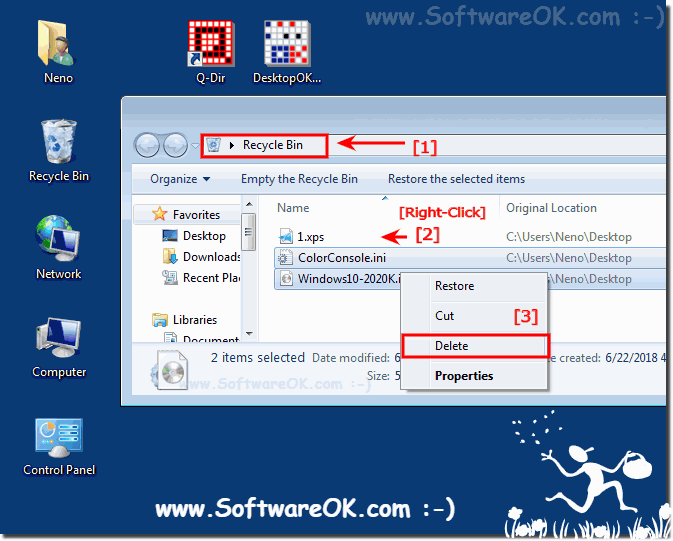 Windows-7 - FAQ-44: How to delete files without the Recycle Bin in Windows 7, 8.1, 10? Emptying recycle bin without graphic (and Windows 10, 8.1)? How to delete files in windows without recycle bin in windows 7 and Windows 10, 8.1? Permanently delete items without going to recycle bin (and Windows 10, 8.1)? Permanently delete shortcut (and Windows 10, 8.1)? How to delete file without sending to recycle bin shortcut key (and Windows 10, 8.1)? How to delite a trash file in my windo 7 and Windows 10, 8.1? NoRecycleFiles in Windows 8 (and Windows 10, 8.1)? Delete without recycling bin eg Windows 7 delete without trash (and Windows 10, 8.1)? Win7 one folder not delet how to delet (and Windows 10, 8.1)? Is It Possible To Delete A File Without The File Entering The Recycle Bin (and Windows 10, 8.1)? Windows delete without recycle bin? Shortcut key of delete item without recycle bin? Windows7 delete file restore withought app? Windows any way to delete files without recycling? Recycle bin removal windows 7 and Windows 10, 8.1? Windows 7 delete folders without recycle bin? Delete without recycle bin windows 7 and Windows 10, 8.1? Delete without going to trash? Delete files without going to recycle bin windows server 2008? Windows 7 permantently delete vs recycle? Windows delete files without recycle bin? Windows 7 Delete without Recycle? File delete but not put in recycle bin windows 7 and Windows 10, 8.1? Download delete no move to resycle bin Windows click move .exe? Windows server 2008 how to delete files without sending to recycle bin? Is it possible to delete a file without the file entering the recycle? How to permanently delete a file without sending it to the recycle bin? Windows 7 how to delete files without putting in recycle bin? How do I delete files without putting them into the recycle bin? How to Delete a file directly without sending it to Recycle Bin? How do i delete all the extra shortcut of the recycle bin without deleting the original one on windows 8? Delete files without going to recycle bin windows 7 and Windows 10, 8.1? How to delete file without sending in recycle bin? How to delete a file without moving it into recycle bin in windows 7 and Windows 10, 8.1? How do i delete a file on windows 7 without going to recycle bin? In windows how can u delete afile without it going to the recycle bin? To show Empty Recycle Bin from the Desktop Context Menu? How to permanently delete any pic from all folder in window? When i delete a file it asks to permently delete instead of sending to the recycle bin? How to delete multiple files in windows without recycle bin? Windows command to delete directory without recycle? How to delete file in recycle bin without opening the application? Windows explorer 2008 delete without recycling? How to delete a folder from pc without it going to recycle bin? How to delete recycle bin with out desk top icon on windows 7 and Windows 10, 8.1? Windows delete files without going to recycle bin? How to get my del file without recycle? Win7 delete folder, not recycle? Shortcut to delete files without going to recycle bin? Windows 7 how to dele 170000 files? Server 2012 delete without sending to recycle bin? Win 7 delete files without recycling? How to delete a folder without it entering the reycle bin? How to delete without recycle bin? WINDOWS 7 DELETE VS RECYCLE? Windows 7 delete no recycle (and Windows 10, 8.1)? DELETING FILES BY PASSING RECYCLING WITH WINDOWS 7 and Windows 10, 8.1? Windows 7 permanently delete (and Windows 10, 8.1)? Win7 delete files without recycle bin? How to delete without entering recycle bin in windows 7 and Windows 10, 8.1? Restore Recycle Bin deleted files Windows? Empty recycle bin windows 7 and Windows 10, 8.1? How to restore recycle bin windows 7 and Windows 10, 8.1 basic? Delete without recycle bin 7 and Windows 10, 8.1? Windows delete folder without recycle (and Windows 10, 8.1)? Recycle bin in windows 7 home baisc (and Windows 10, 8.1)? Recover files from the Recycle Bin? How to recover files from the Recycle Bin in Windows 7 and Windows 10, 8.1? Deleting files without going to recycle bin(and Windows 10, 8.1)? HOW TO DELET WITHOUT MOVING TO RECYCLE BIN WIN 7 and Windows 10, 8.1? How to delete on windows 7 with not trash? Windows explorer delete without recycle(and Windows 10, 8.1)? Remove confirm delete recycle bin? Windows 7 file delete no recycle(and Windows 10, 8.1)? Windows 7 delete without recycle bin? How to settings delete file without recycle bin(and Windows 10, 8.1)? Pc windowd 7 how to delete files without putting in trash? Windows 7 delete without going to recycle bin(and Windows 10, 8.1)? Delete file in windows 7 without recycle bin? Delete no recycle bin windows(and Windows 10, 8.1)? How to remove recycle bin icon from desktop in windows 7 home basic(and Windows 10, 8.1)? How to restore recycle bin windows 7 basic in Windows 7 and Windows 10, 8.1? Recycle files (and Windows 10, 8.1)?